Python can be used for more than just general-purpose programming. It is a free, open source language and environment that has tremendous potential for use within the domain of scientific computing. 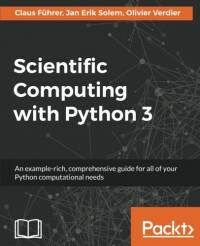 This book presents Python in tight connection with mathematical applications and demonstrates how to use various concepts in Python for computing purposes, including examples with the latest version of Python 3. Python is an effective tool to use when coupling scientific computing and mathematics and this book will teach you how to use it for linear algebra, arrays, plotting, iterating, functions, polynomials, and much more. Claus Führer is a professor of scientific computations at Lund University, Sweden. He has an extensive teaching record that includes intensive programming courses in numerical analysis and engineering mathematics across various levels in many different countries and teaching environments. Claus also develops numerical software in research collaboration with industry and received Lund University’s Faculty of Engineering Best Teacher Award in 2016. Jan Erik Solem is a Python enthusiast, former associate professor, and currently the CEO of Mapillary, a street imagery computer vision company. He has previously worked as a face recognition expert, founder and CTO of Polar Rose, and computer vision team leader at Apple. Jan is a World Economic Forum technology pioneer and won the Best Nordic Thesis Award 2005-2006 for his dissertation on image analysis and pattern recognition. He is also the author of "Programming Computer Vision with Python" (O'Reilly 2012). Olivier Verdier began using Python for scientific computing back in 2007 and received a PhD in mathematics from Lund University in 2009. He has held post-doctoral positions in Cologne, Trondheim, Bergen, and Umeå and is now an associate professor of mathematics at Bergen University College, Norway.